Within six months of playing shows in Seattle, The Protocol headlined Seattle's premier and most historic venue - The Crocodile Cafe. Led by charismatic frontman Rob Bach, The Protocol is known for bringing tremendous energy to its live shows. 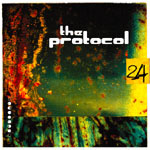 The Protocol released its debut full length in November 2004 with producer/engineer Floyd Reitsma at STUDIO LITHO (Pearl Jam, Deftones, Staind, Dave Matthews) and it debuted at No. 6 on the Sonic Boom Top - 20 Best Seller List. The Protocol also partnered up with entertainment lawyer Steve Sessa (Muse, The Ataris) to handle manager/label inquiries. The Protocol is currently recording their sophomore effort and it promises to be one of the top releases of 2006. You can check out the music of The Protocol at www.hellyhansen.com if you watch their snowboard and ski videos. You can also listen to The Protocol every night on Locked on Sports AM 950 in Seattle, WA. We would not have gotten this far without your support and energy you bring to our live shows. Thank you so much.